- - two opportunities to hear Kristine's new work, prior to the world premiere in Columbia, Missouri! Free champagne and "talk-back" to the actors and playwright. and let us know how many glasses of CHAMPAGNE we should order! Kristine Holmgren is a produced Minnesota playwright - but you may remember her earlier career as a columnist for the Star Tribune and elsewhere. Baltimore Sun, and Los Angeles Times. Holmgren's short stories are anthologized in The Magic of Christmas Miracles, published by William and Morrow and her life outlined in In the Company of Women; published by Minnesota Historical Society Press. She is a frequent commentator for National Public Radio’s All Things Considered. Her plays include "PAPER DADDY" (Northfield Arts Guild, Northfield, MN 2011; Talking Horse Theatre, Columbia MO 2013; Little Theatre, Lake of the Ozarks MO 2015), “SWEET TRUTH” (Berlin Theatre, Columbia, MO, 2013). "THE GIVING HOUSE, A GHOST STORY" was commissioned by the Minnesota Historical Society and is in search of a production house. “GOD GIRL” is her first autobiographical play, and "GRANDMA BERNICE TELLS ALL" is her first 'one woman' show. Holmgren fourth production; STAR BABY, is slated for 2020 production in Columbia, Missouri. Holmgren gets her material from her history as a single mother who raised to two successful, professional women. 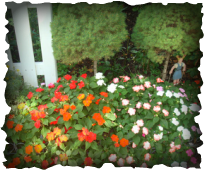 She lives in St. Paul with an adolescent Scottish Terrier,: Mary Queen of Scotts. In her spare time, Kristine swims Minnesota lakes, hikes Minnesota trails, knits Minnesota sweaters and tries to catch an occasional nap. 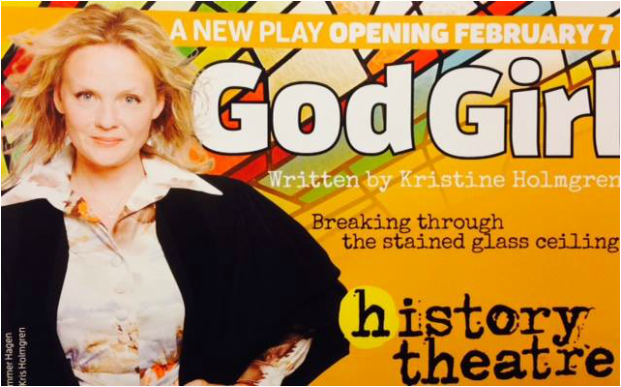 GOD GIRL by Minnesota playwright Kristine Holmgren, premiered at the History Theater in 2014. This powerful play explores the hard work, humor, and heartbreak experienced by the first brave women who dared smash the stained glass ceiling of Protestantism. GOD GIRL is part of the "Striking Conversations" season of the Northfield Arts Guild Theatre. “Fargo” meets “Harvey” in this heart-warming comedy by Minnesota playwright, Kristine Holmgren. The week before Christmas, 1958; a small town in Minnesota. Bernice Petersen, a Swedish/American drops dead pulling a 50 pound turkey from her freezer. Tragic? Oh, yes. On many levels. With Bernice dead, who will make the lefse? The fattimand? Who will send the cards? Decorate the tree and string the lights on the garage? Born in 19th Century Sweden, raised near the South St. Paul Stock Yards, Bernice Holmgren married twice and divorced without regret. All before it was cool. Along the way she drove cattle from Iowa to Fosston, Minnesota - owned and ran a cafe in Iowa - raised four children, and managed to perfect art of sooth saying. Join her on stage as she reads the cards of lucky audience members, and shares her wisdom, humor and warnings. "Some little children were never meant for this world." Eight-year-old Duchess's best friend has disappeared and no one seems to care. Did something terrible unfold in the angry Wilnuts house - - something that took Chrissy away forever? And if it did, whwon't the grown-ups fix it? A 1950's childhood breaks open when a little girl learns the ugly secrets of those who call themselves "The Greatest Generation." Commissioned by the Minnesota Historical Society, THE GIVING HOUSE seeks a world premiere and production support. Once a grand St. Paul mansion, the house on Hopkins Avenue has fallen into disrepair. Shabby, neglected - the place is divided into six over-populated apartments. He survived four deployments to the Middle East - and now all he wants is an opportunity to disappear. The house - and its inhabitants, both living and dead - have another plan. Princeton Theological Seminary, 1976. The war in Vietnam is over, the women’s liberation movement is in full swing, and Kris Holmgren joins the first large population of women seeking ordination into the Presbyterian ministry. Will she survive the cynical, sinister secrets of her new career? Charlie Pomeroy was once the princess of Northfield - married to the Dean of Carleton College and hostess to one of the grand mansions of Rice County. Now - reduced to poverty when her husband abandoned her - Charlie's mansion is a boarding house for a collection of fascinating strangers. The ashes of her dead ex-husband are in a canister on her dining room table -her daughter is coming home, expecting a funeral. ​Will Charlie rise to the occasion? And will what role will "Harvey Wallbanger" have in her transformation? Bernice Fairfax is about to turn fifty-years-old. Divorced and a little desperate, her cupcake shop is faltering, her fourteen-year-old daughter is on a piercing binge, and her love-life verges on crazy. 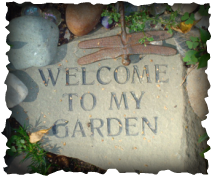 Will a visit from Sheila,her Druid priestess mother - and Amaranth - a silent, aging shaman -change anything? 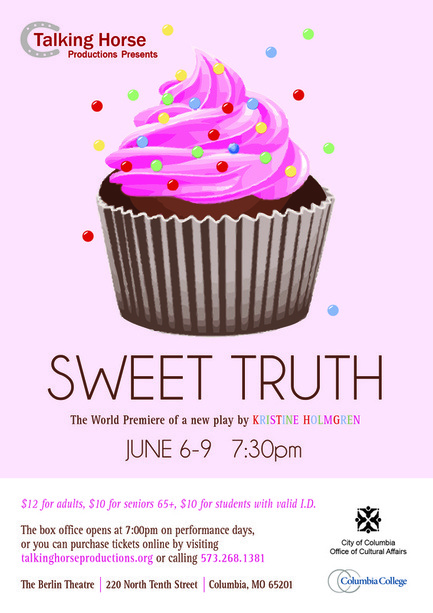 "My theatre company, Talking Horse Productions of Columbia, MO, recently staged the premiere of SWEET TRUTH! Great audience response, folks! This sweet little comedy is a winner, and your audiences will love it, too! Highly recommended! Kristine came to Missouri and did playwright talkbacks with our audiences. Kristine Holmgren; At Your Service! A quiet warning from your favorite playwright. . .
Everything is subject to copyright. For more information about any of Kristine's plays, or to ask her a question about her craft, please use the form below. When Kristine Holmgren's husband left her for a younger woman, she turned her dismay into writing. "AFTER HIS HEART" is a fast read - and a curious romp through the curious territory of clueless love. Holmgren's unflappable commitment to romance is her fatal flaw. Even so, she does have her charm and these stories delight. Her work first appeared in the Star Tribune. These stories, like most her work, appeared in the Boston Globe, Los Angeles Times, Chicago Tribune, and Baltimore Sun.